Connecticut covers 5544 square miles and has a population of 3,405,565 people. 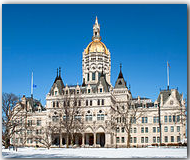 Connecticut’s capital is Hartford, which has a population of 121,578. Other important cities are Bridgeport, (pop. 139,529), Danbury (pop. 74,848), Greenwich(pop. 61,101), Norwalk (pop. 82,951), Stamford (pop. 117,083), Bristol (pop. 60,062), New Britain (pop. 71,538), West Hartford (pop. 63,589), New Haven (pop. 123,626) and Waterbury (pop. 107,271). Connecticut was admitted to the Union on January 9, 1788 as the 5th state. The state flower is the “Mountain Laurel” and it’s nickname is “The Constitution State”. Connecticut’s economy is broken into two categories; agriculture and industry. Nursery stock, eggs, dairy products and cattle provide for the agricultural side. While transportation equipment, machinery, electric equipment, fabricated metal products, chemical products and scientific instruments provide for the industrial side.